John Crawford, in flamethrowing action at last year's Supercup meeting. For 2001 John will be Suzuki's sole Superbike pilot...watch him go after a tough learning year as team-mate to GP bound Chris Walker. Welcome to Karmic Media Inc.
We specialise in Motorcycle Road Racing, Journalism & Photography. 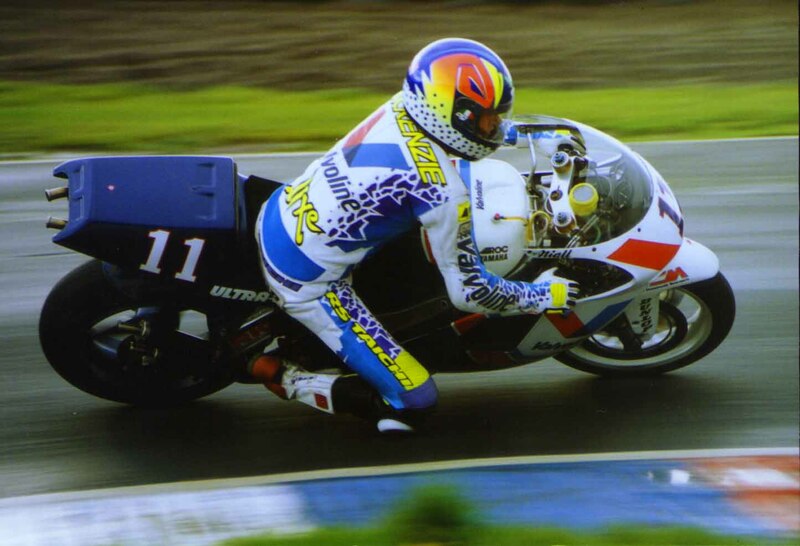 Niall Mackenzie Slip sliding the ROC Valvoline 500cc Yamaha Grand Prix Bike around a windswept Knockhill 1995. 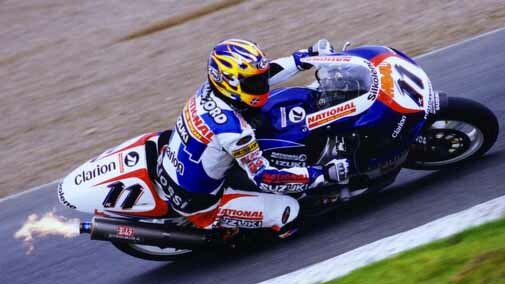 Niall was triple British superbike Champion and had a glittering career in 500cc and 250cc Grand Prix. He has finally hung up his leathers for 2001 but will take on a development role with Suzuki GB and Red Bull Yamaha. (Click on Niall to link up to Bikesportnews....hav'nt heard of it ..then you need shot...bang!!!!! 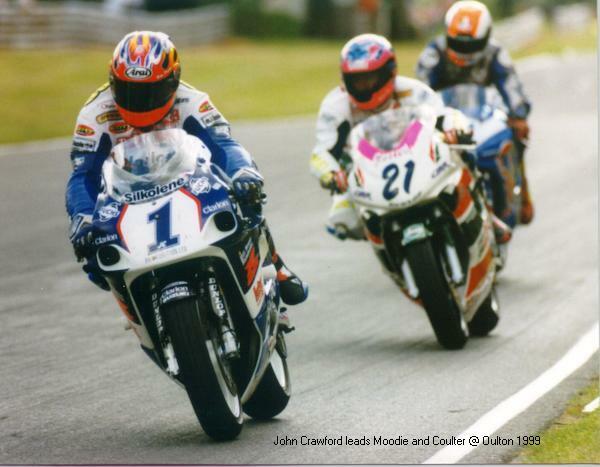 Just had to use this pic of Craw,Moodie and Coulter, taken at Oulton park in 99 by H.T. Send us your favourite snaps for the site. THe idea of the site is to promote all things good about motorcycling in Scotland. If you have any thoughts or topics you wish to discuss with the Karmic Media crew ....just drop us an emmy and we will get back to you as soon as I can get Harvey off the Bikenet forum. 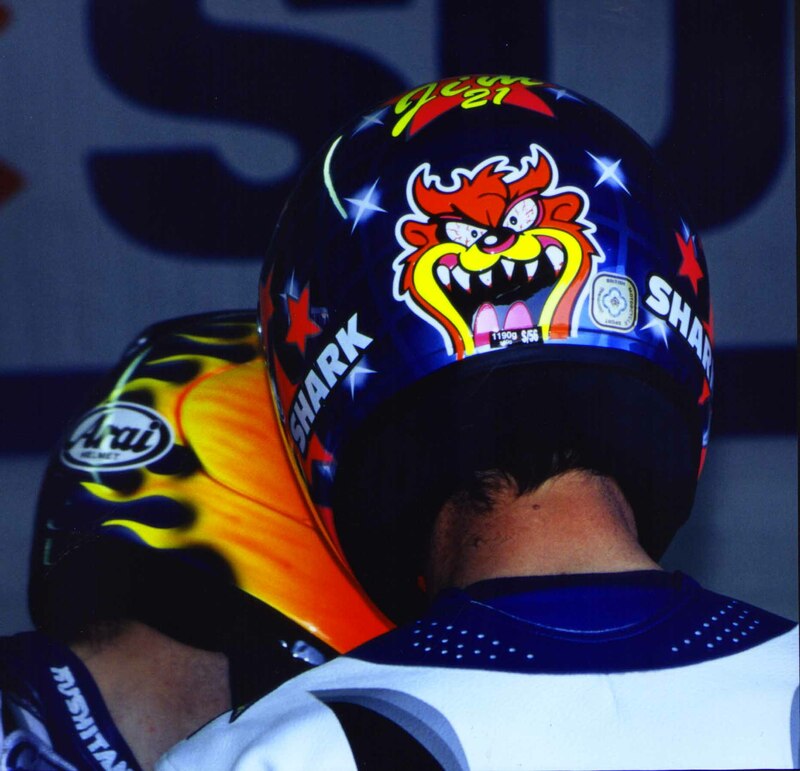 Below you see the scary image of the mad dog ...click on him to get a link to the TT website. The site is run by Paul Phillips and is one of the best around for race interviews and news about the pure road race capital of the world. Check it out, it has a good bulletin board to peruse. 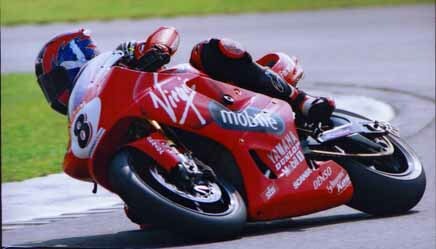 11 times TT winner Steve Whizzlop, will ride for the Paul Bird/Monstermob Ducati in BSB. Steve is now fully recovered from jis Brands smash last year and is looking forward to this years series. He has also intimated that there could be selected non-superbike rides in the offing. 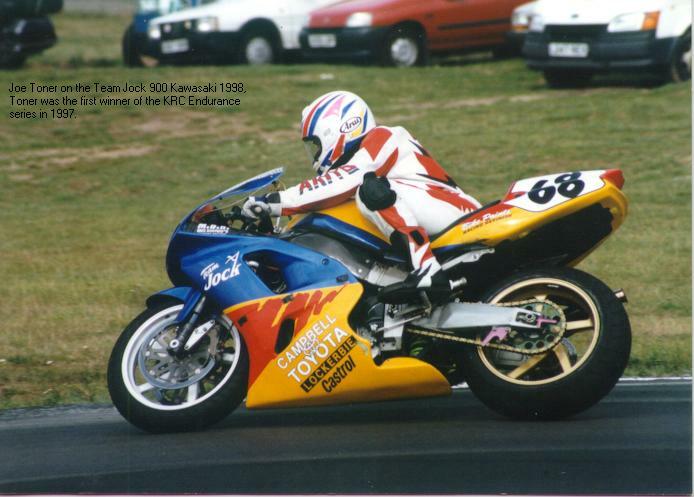 The TT star last raced Ducati machinery in 1997, but is in with a real shout of major honours this term. Click on "Fat Boy" here and get a link to my sponsors, this is the NC after my gymnastics routine at the previous Knockhill meeting. The bike will remain in the same spec for this season where I am led to believe there is in excess of 40 runners in the series...should be allright for a couple of 50%'s then?. The bike is at present being prepared for the season ahead. I am in negotiations with some leading product and commercial companies who wish to assist the racing effort. When there are more details I will update the post. There has been a major upsurge in interest for the Sports Production Class with many of the top runners switching to Suzuki's new 1000cc model. Latest recuits are leading Scot on the Supercup scene Iain Campbell (Iain scored numerous top 15 positions against the likes of Glen Richards, David Jefferies and Gary Mason). top home based rider Steve Allen has also made the switch so watch out for this pair in International racing next year. Scotfibres boss Ron Thomson will run a two man 125cc team in Scottish and English club racing this term. Angus (Son) joins the jovial Ronno on a brace of RS 125cc Hondas currently being re-vamped at FW Developments. If you click on the visual you will get a direct link to Bikesportnews...the site will soon be going under a revamp, so bear with it just now. You can order the paper via the site so get the credit card out!!!! 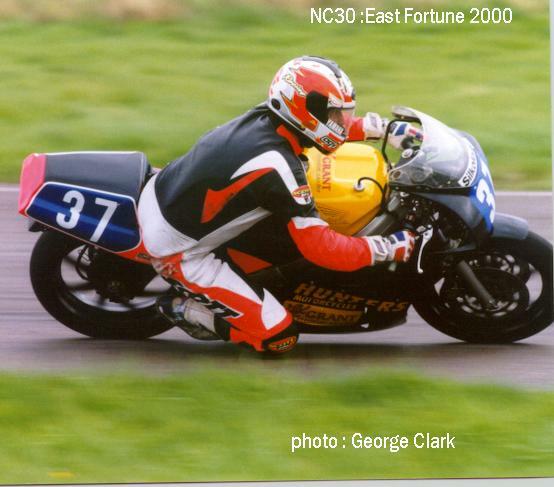 Joe Toner on the 900 ZXR Kwacker, Snetterton 1998. Joe is up and running after his Croft mishap and the Endurance star is penning in selected events for this year...go get em JoeToe!!!!! !